I would like to wish all mothers a wonderful Mother's Day. And to my mama, the strongest, most loving woman I've ever know, Happy Mother's Day! To Read More, Click On The Recipe Title. I made these cookies for Mother's Day because they aren't your everyday cookies. They take a little care to make, but once you make them you'll want to do it again. The first time I made these , it was dessert for a dinner at a neighbors house. We brewed coffee and ate these cookies. They were absolutely amazing. These cookies are chewy and crispy with a layer of milk chocolate in between. I've taken pictures so lets get started making these very special cookies. You probably have everything you need to make these cookies. There's nothing exotic in the recipe list. I had regular oats in my cupboard, not quick oats as the recipe called for. 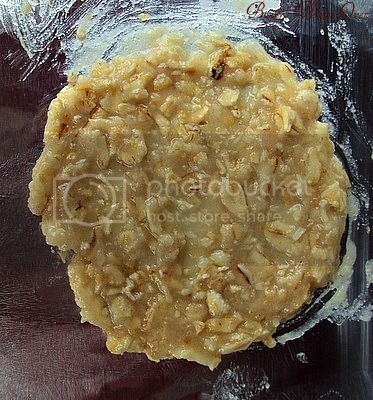 You can make quick oats by taking regular oats and pulsing them in the food processor a few times. And that's what I did. Measure all your ingredients out and melt your butter. 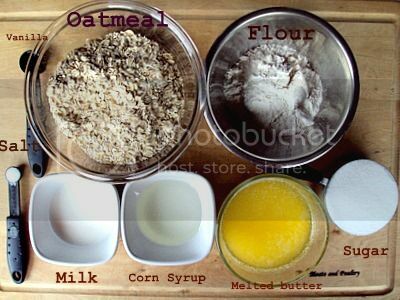 Put all the ingredients together in a large bowl and mix with an electric mixer. Scrape down the sides and bottom of the bowl with a spatula to incorporate well. 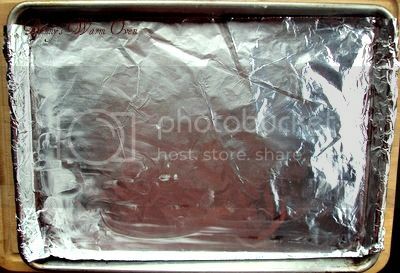 Line two large baking sheets with foil and lightly grease with shortening. The recipe said that you might have to use a new foil every time you put a new batch of cookies on the cookie sheet. I was able to use the foil multiple times. I only had to change the foil once for each sheet. 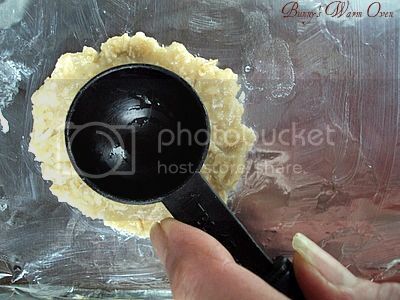 Take teaspoon fulls of dough and place them 3 inches a part on the cookie sheet. I only put 6 balls on each sheet because the dough spreads as it bakes. Take a spoon ( I used a 1 tablespoon measuring spoon) , dip it in water, starting in the center make circular motions until you have a thin layer of dough on the sheet. Dipping the spoon in water is a helpful hint, it keeps the dough from sticking to the spoon and makes it easier to spread the dough. Don't spread the dough so thin that you can see the baking pan underneath it. They will spread as they bake. Try the best you can to make a nice round circle. Bake your cookies at 375 degrees for about 8 minutes. You're going to have to watch them, peek at them often. When they start to brown around the edges, take them out of the oven. Some of mine got more brown but that just means they're a little more crispy. I actually liked them better that way. 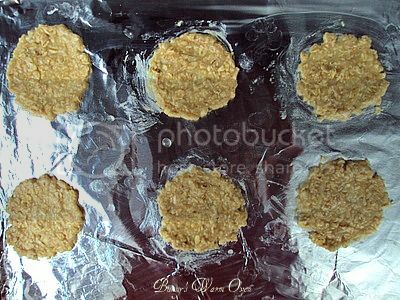 After you take them out of the oven, lift the foil off of the pan and place the foil with the cookies on it , on a wire rack to cool. They don't take long to cool. After they have cooled, peel the cookie off of the foil. 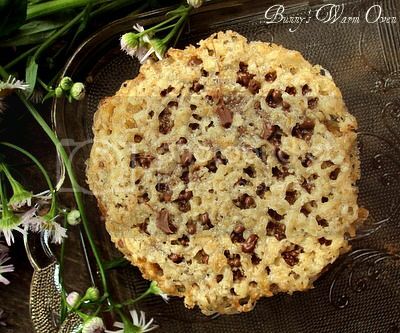 These cookies are fantastic just like this, without chocolate!! 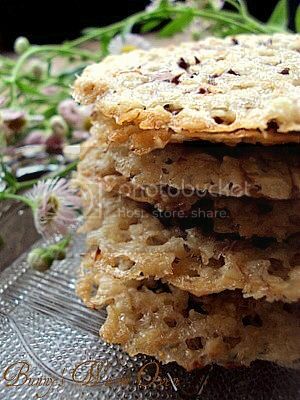 Crispy buttery wafers that are addicting all by themselves. Melt the chocolate by microwaving it in a microwave safe bowl at 50%,stirring frequently as chocolate burns easily. 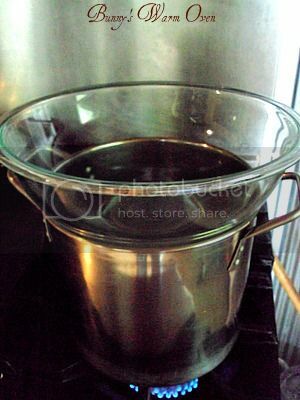 Or you can use a double boiler as I did. Take a pot and fill it with about 2 inches of water. Place a large bowl on top of it, making sure that the water doesn't touch the bottom of the bowl when it starts to boil. Keep stirring until your chocolate is melted and smooth. Cool chocolate slightly. Lay your cookies bottom side up, take a knife and spread a thin layer of milk chocolate on the bottom of one cookie and top it with the other cookie. Because these cookies have tiny holes in them, there will be some chocolate coming through the holes. Just let the chocolate dry before you handle them. 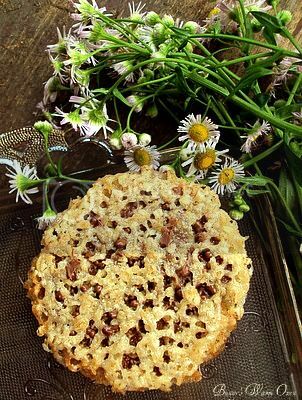 And there you have it, Milk Chocolate Florentine Cookies, special cookies for a special day. To print recipe, click here. Tip: Use standard measuring cups and spoons or scales for accurate measuring. Preheat oven to 375 degrees F. Prepare 2 large baking sheets; line with foil and lightly grease with shortening. 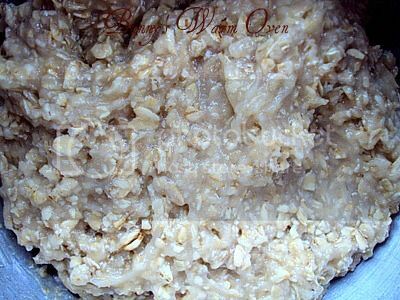 In a large bowl of an electric mixer, combine melted butter, oats, sugar, flour, salt, corn syrup, milk, and vanilla; mix well. 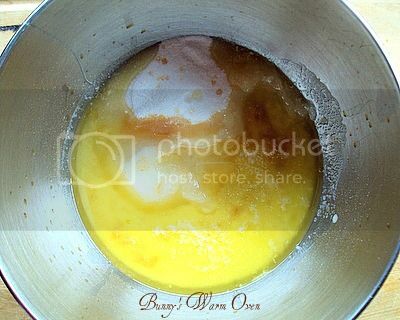 Scrape down the sides and bottom of the bowl with a rubber spatula so the mixture blends evenly. 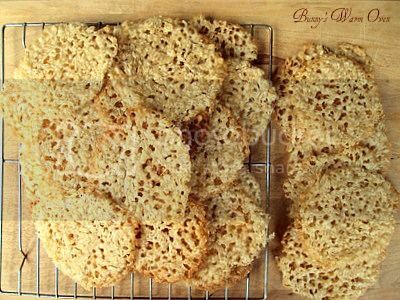 Bake 8 to 10 minutes or until the edges are very lightly browned. Remove cookies from baking sheets with a metal spatula and place on a wire cooling rack to cool. Gently peel foil from cooled cookies. Tip: since the foil will probably crumple and tear when peeling away from the cookie, plan on using a fresh sheet of foil for each pan of cookies. 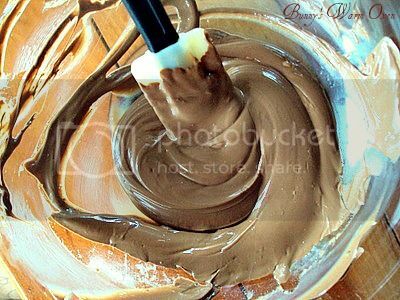 Intop of a double boiler over hot water, melt the milk chocolate. Or, place the chocolate in a microwave-safe bowl, use 50% power and stir frequently just until the chocolate is melted; do not overheat as chocolate will burn easily. Set aside to cool slightly. 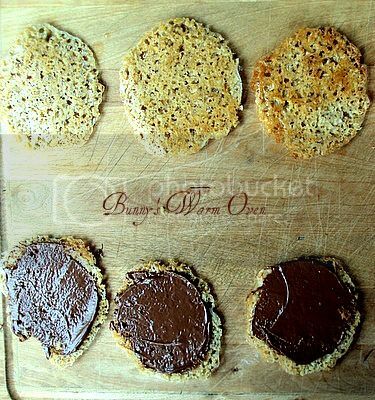 Spread a thin layer of melted chocolate onto the flat side of half the cookies. 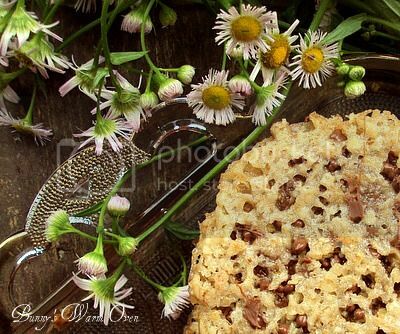 Top with remaining cookies, placing flat side onto the chocolate. HOW interesting! I am absolutely going to have to make these!!! I've always wanted to make these. I'd have to make a part batch with dark chocolate, for my men. Moi? Milk chocolate, all the way! Will my silicone sheets work as well as the foil? Hi tabaccs. I've never worked with silicone sheets so I can't tell you if it would or not. But can I ask a question since you have. 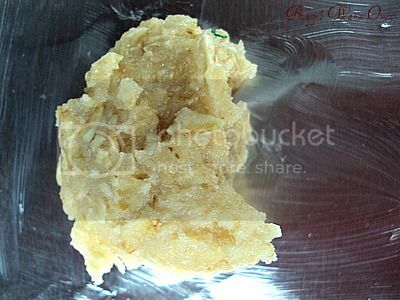 Will the silicone sheet make the bottom of the cookies crisp? If you try it please come back and let us know if it works! I hope you do make them Leslie they're wonderful cookies! Debby, milk chocolate all the way!! !Although semi sweet chocolate does have it's place too. Let me know how you like them.